ikonoTV presents 'Digital Canvas' its 24-hour digital event of digital art featuring 20 international artists. Digital Canvas brings together 20 outstanding international artists with more than 60 works that explicitly employ the use of electronic and digital tools while making direct references to art history by incorporating traditional disciplines. Eelco Brand uses both paint and digital techniques to create a hyper-real cosmos that reflects his conception of nature. Cosimo Miorelli creates a new form of storytelling with live-drawing sessions accompanied by music, executed on a tablet and recorded. Yannis Kranidiotis creates visual soundscapes by digitally re-elaborating old masterpieces. The winner of our open call Ulla Nolden, investigates movement and its rules in everyday environments, and visualizes its abstract algorithms by using an aesthetic language that she has developed in her photographic work. Digital Canvas also features outstanding work by Kurt Hentschläger, Claudia Hart, Andreas Nicolas Fischer, Johanna Reich, Nicolas Rupcich, Feng Chen, Dejan Radovanovic, Daniel Canogar, Claudia Larcher, Mateo Amaral, Monica Heller, Ryan Whittier Hale, Chris Coleman, Laleh Mehran. In addition, Digital Canvas gives a Carte Blanche to Marco Mancuso (Director of Digicult) and to The One Minutes, a global network based in Amsterdam producing and distributing films with the duration of one single minute. 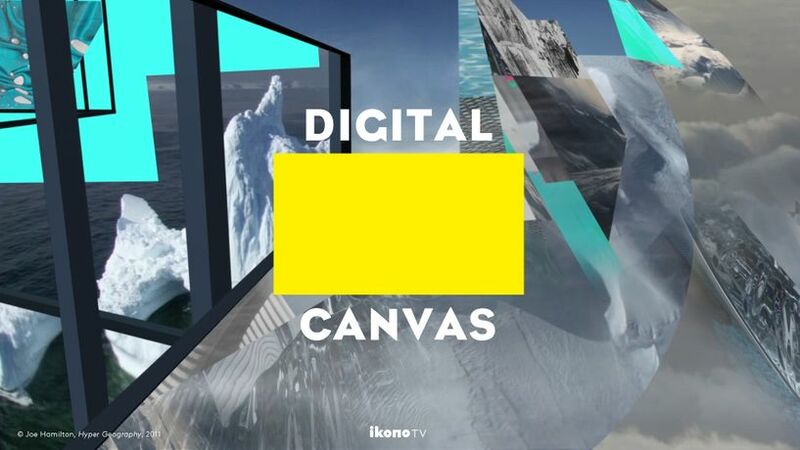 Digital Canvas will be broadcast exclusively on ikonoTV for 24 hours, starting on May 7th at 6PM (CET). It will premiere during the Creative Tech Week in New York, on the 28th and 29th of April. Save the date, stay tuned.